We know what you’re after. 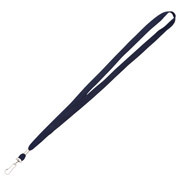 You’re looking for a place that sells cheap & unprinted lanyards and can get them to you in no time, right? Well you’re in luck because along with our range of printed lanyards we also sell a simple collection of plain & unprinted lanyards. We’ve organised them into colours for you to make it much easier to browse and when you’ve found one you like, send us through an enquiry or order and we can almost always arrange a same day dispatch for you.